We’ re pleased to announce the arrival of some fabulous frocks to the collection online. 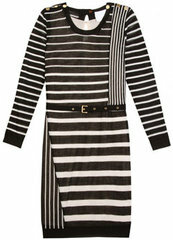 Designer dress newcomers include this asymmetrical striped dress with buckle and gold toned button detail by Cambodian-American fashion designer Phillip Lim for his label, 3.1 Phillip Lim. Designer evening dresses also new to Girl Meets Dress were this divine Butter by Nadia short jersey dress in sapphire. Having already received numerous accolades, this dress really is as versatile as you want it to be, wrapping in unfathomably numerous ways. And as if more needed to be said, it’s one of our designer evening dresses that fits all sizes, which can be dressed down for day if needed. Next, this chic ‘Modern’ dress by Schumacher makes its debut onto the online designer dress hire pages here at Girl Meets Dress. With gray trim detailing and lace floral embroidery, this dress ticks all the right Spring/Summer 2011 trend boxes. We predict these dresses are going to be the real ‘hot cakes’ for online designer dress hire in the coming months. Introducing the Charleston style beaded sleeveless dress by Day Birger et Mikkelesen, one of the most flattering choices from our designer evening dresses collection. Suitable for almost any occasion from weddings to a glamorous night out on the town. Next in line, are these two striking Halston Heritage pieces. Steal the show in this vivid neon pink tiered fuschia playsuit or alternatively, bowl everyone over in this sultry twisted halter dress – a stunning addition to our designer evening dresses collection as we’re sure you’ll agree. Online designer dress hire has never been so good! Who would want to go to a shop? Posted April 14th, 2011 in GMD Daily, The Week in Dresses. Tagged: 3.1 Phillip Lim, Butter by Nadia, Day Birger et Mikkelsen, designer evening dresses, Halston Heritage, schumacher.